Collegium Civitas lecturer Dr Kerry Longhurst took part in a video series “British-Polish Science Stories” by the British Embassy highlighting UK scholars working in Poland. 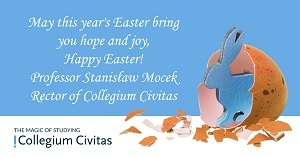 Ladies and gentlemen, We kindly inform you that from 19.04 (Friday) - 22.04 (Monday) Collegium Civitas is out of office. We wish you Happy Easter! We are happy to announce, that the second edition of #ErasmusPolandTravel competition has already started! 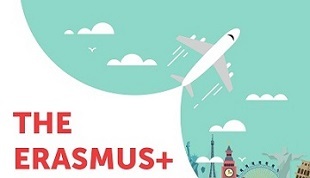 #ErasmusPolandTravel is an online competition carried out on Instagram, aimed at foreign students participating in Erasmus+ in Poland. Share your videos and pictures taken in Poland and give yourself a chance to win one of 13 attractive prizes! Collegium Civitas supports traineeships (work placements, internships, etc) abroad for students at Bachelor and Master level as well as for doctoral candidates. These opportunities are also open to recent graduates. Collegium Civitas and the University of South Carolina Beaufort signed the Memorandum of Understanding. Both institutions have agreed to initiate the process to enhance relations, exchange expertise, and boost academic development. The memorandum outlines the main features of cooperation between both institutions, particularly in academic development, research, exchange of students, faculty, and staff as well as the development of educational opportunities. Social Media Management & Digital Commerce is a new specialization for the academic year 2019/2020 under Sociology master’s degree program at Collegium Civitas. The program starts in October 2019 and the enrollment opens on April 24, 2019. This New Media specialization is the only one of its kind in Poland’s dynamic capital of Warsaw and the only one taught in English throughout all of Central & Eastern Europe. On March 15 the Human Rights Council of the United Nations held a debate on the mitigation and countering of rising nationalist populism and extreme supremacist ideologies. Prof. Rafał Pankowski from Collegium Civitas was one of the speakers. The Master's degree program "International Security Studies" is a brand new specialization under International Relations at Collegium Civitas. It starts in October 2019. This unique program, run under the auspices of the Terrorism Research Center, is designed to train future leaders in the field of security, who will be prepared to effectively face security challenges in the interconnected world of today. The enrolment opens on April, 24. Collegium Civitas cordially invites you for a screening of the documentary “The Curse of Abundance” directed by one of the leading Polish journalists and filmmakers Ewa Ewart. The movie will be followed by a discussion with Mrs. Ewart and experts. The event will take place on March, 22 (Friday) at 17.30 at Collegium Civitas, Palace of Culture and Science, 12th floor, aula (lecture hall) A. 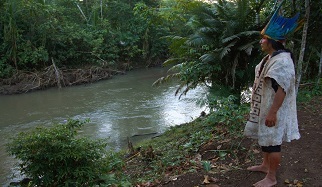 The movie features English subtitles. Free entrance. Collegium Civitas is delighted to meet new students of Academic Year 2018/2019 in the spring semester at Adaptation Days which are going to be held from 25th of February, 2019! We are providing you the agenda of the mandatory meetings.